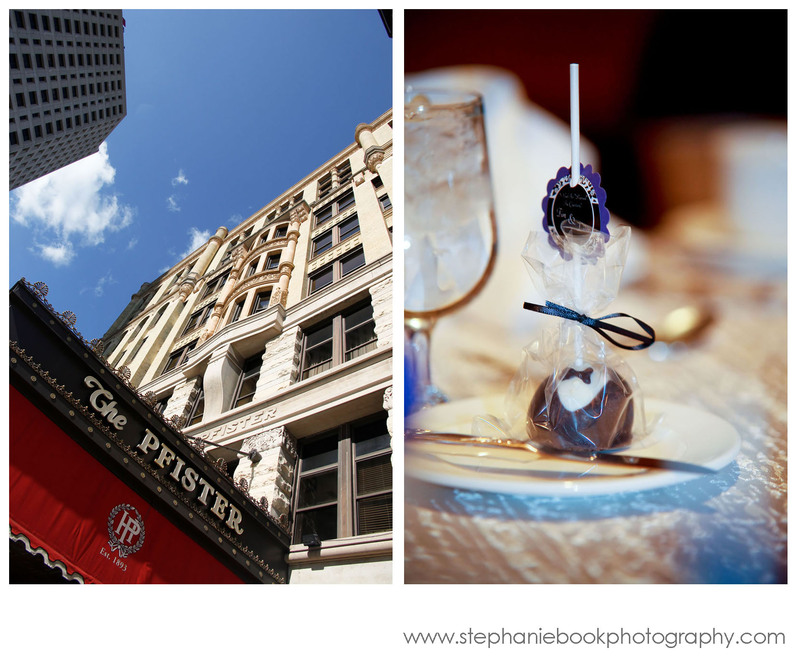 I’m so excited to share this engagement session on the blog, especially as the couple’s wedding day approaches next month. 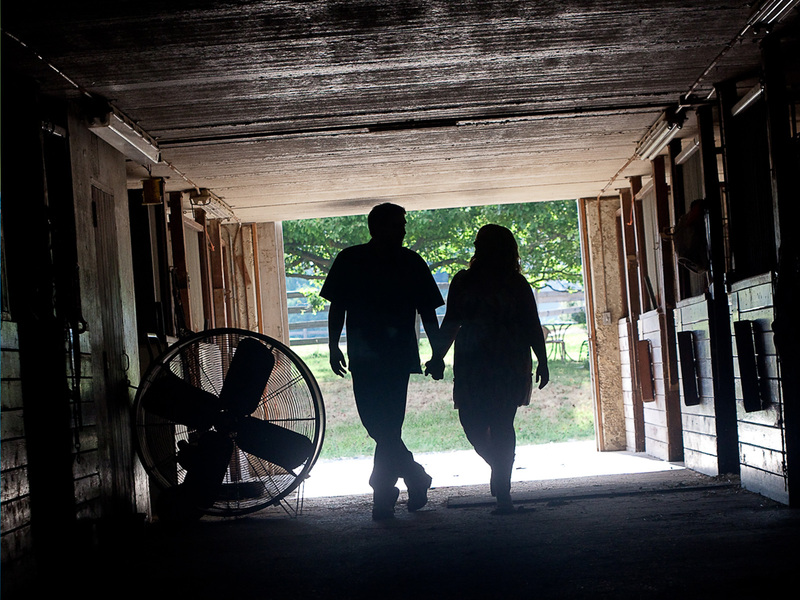 Danelle and Scott met me at Chestnut Hill Farm in Sleepy Hollow, where Danelle boards her horse Skye. 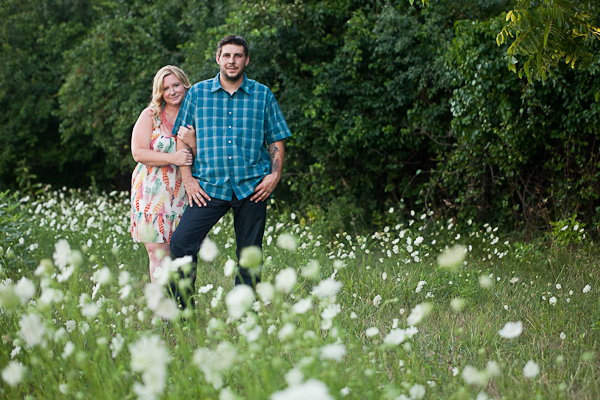 They are such a down to earth couple, we had so much fun walking the property and taking in the outdoors during their summer engagement session. We stared the session in the evening after most of the riders were gone and had the place pretty much to ourselves. 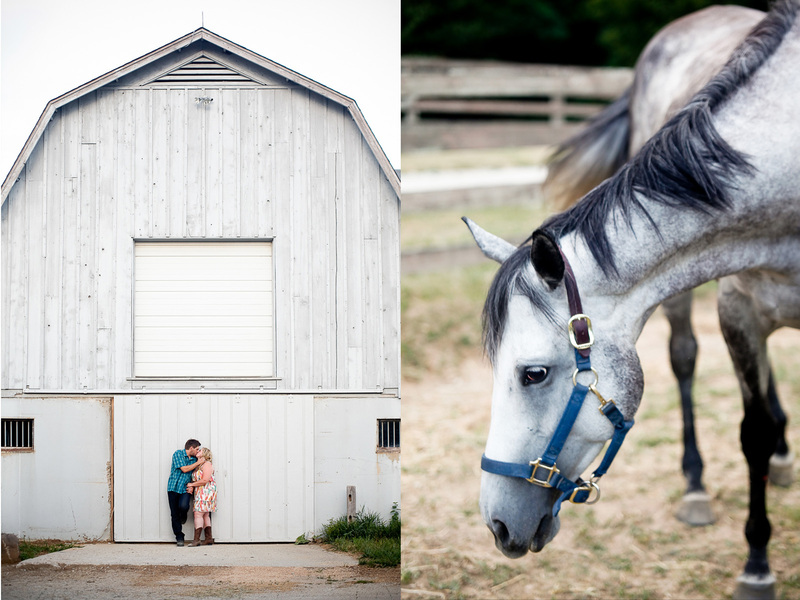 The barn and surrounding wild and groomed areas were gorgeous, and the staff was so gracious in letting us shoot anywhere we wanted. It really was a unique and personal setting and a true reflection of their relationship. 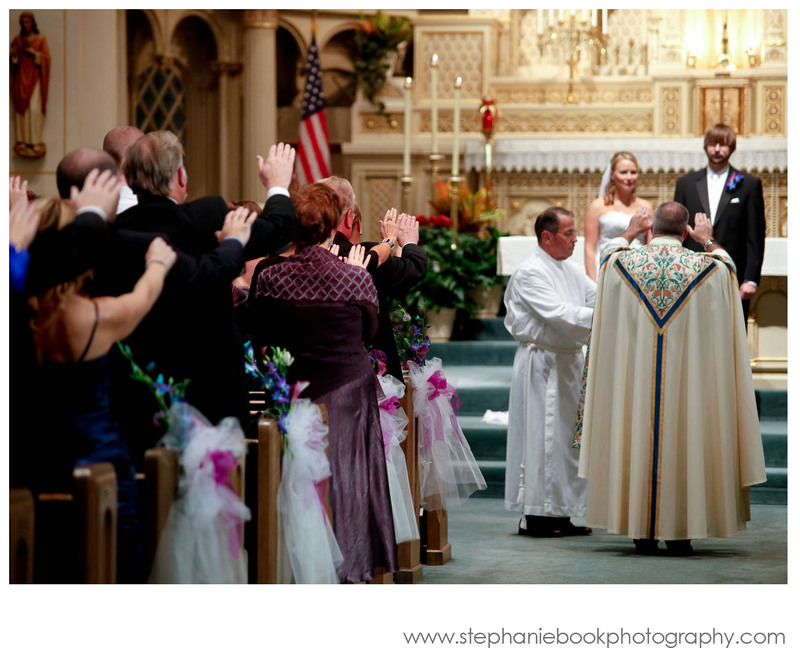 Danelle and Scott, thank you for the opportunity to celebrate with you. 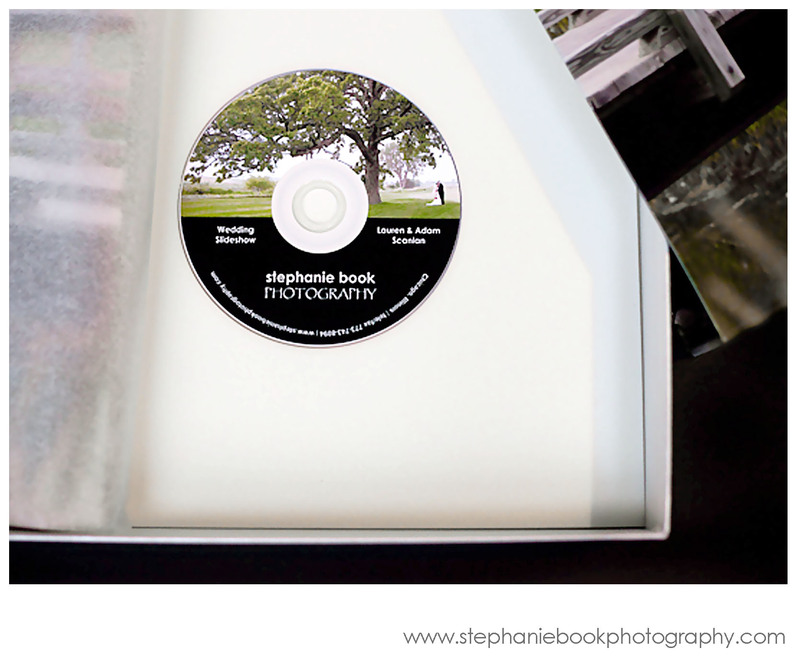 I can’t wait to capture all the special moments with your friends and family. 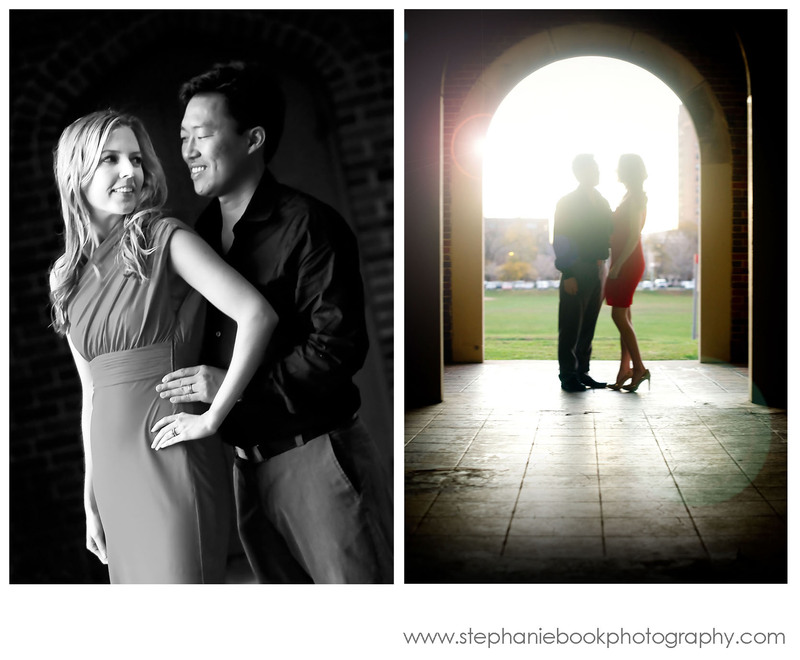 To see more photography from their engagement session view the slideshow. He kept us on our toes in the beginning, but he settled in eventually. 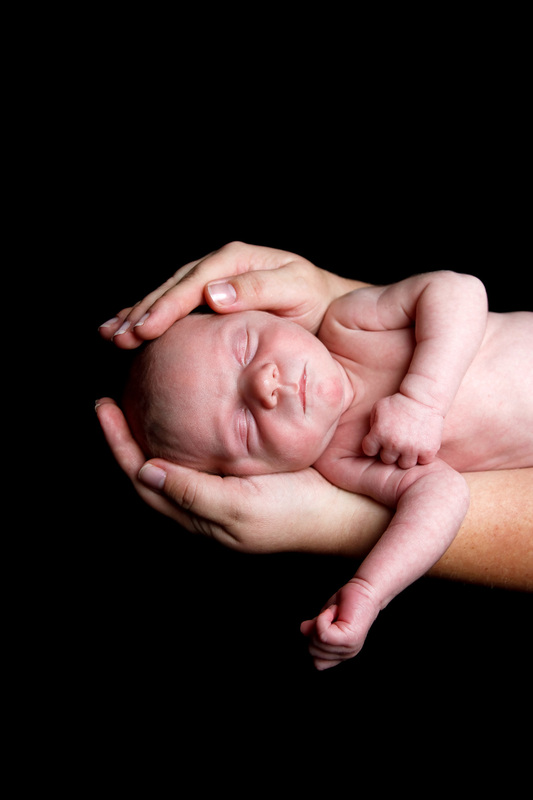 Meet Nathan, 12 days old. Mama’s nickname for him is wiggly. Allison and Michael make a great couple, Allison whom I have known for years. 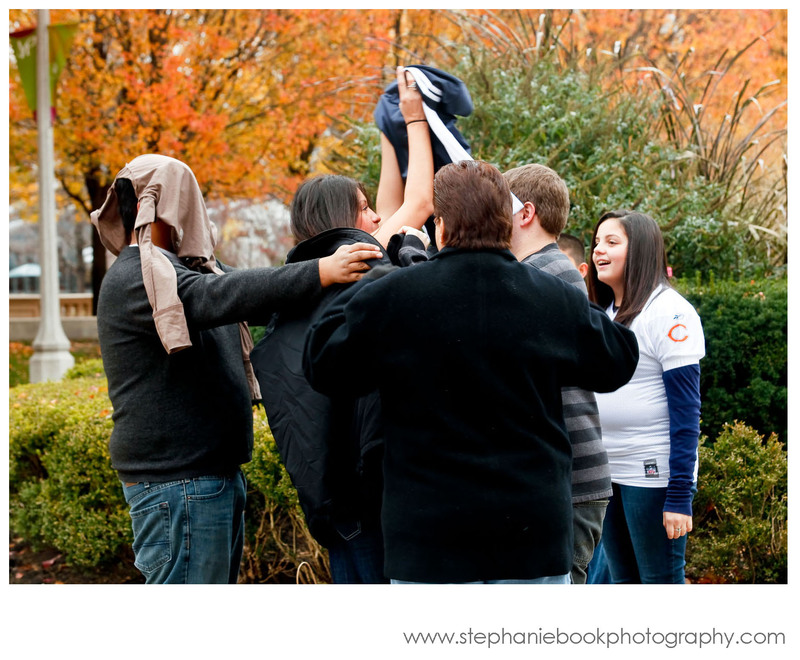 I’m so happy for them to be growing their family, and grateful to have been asked to document these earliest days! 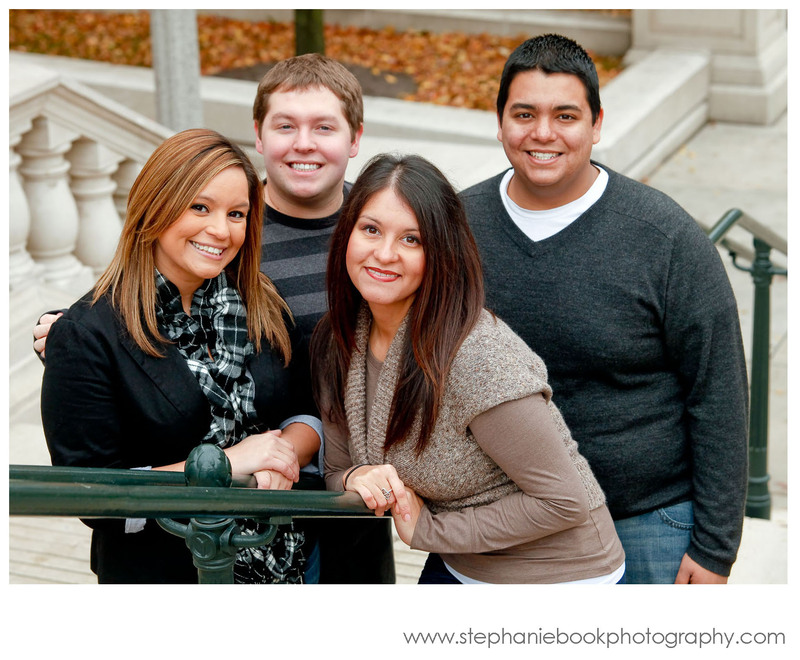 We shot on-site at Nathan’s home in Hanover Park, Illinois. I brought with me a backdrop stand, off-camera speed lights, pockets wizards, and several fabric options for backdrops. 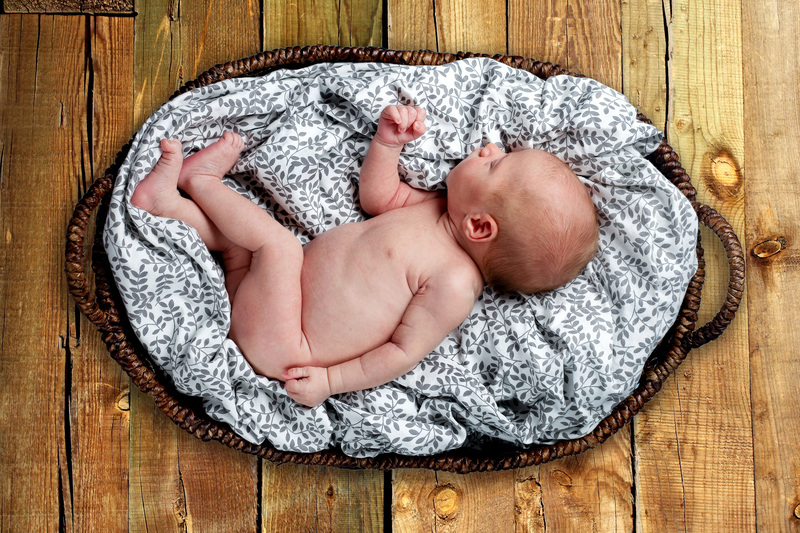 Allison collected some sweet and simple swaddling and basket options. Of course, Nathan owned his shoot, looking adorable and sleepy. It was so wonderful that we were able to schedule the session for a time when grandparents on both sides could participate, especially for those that were visiting from out of state. It was so precious to have generations and in-laws together. 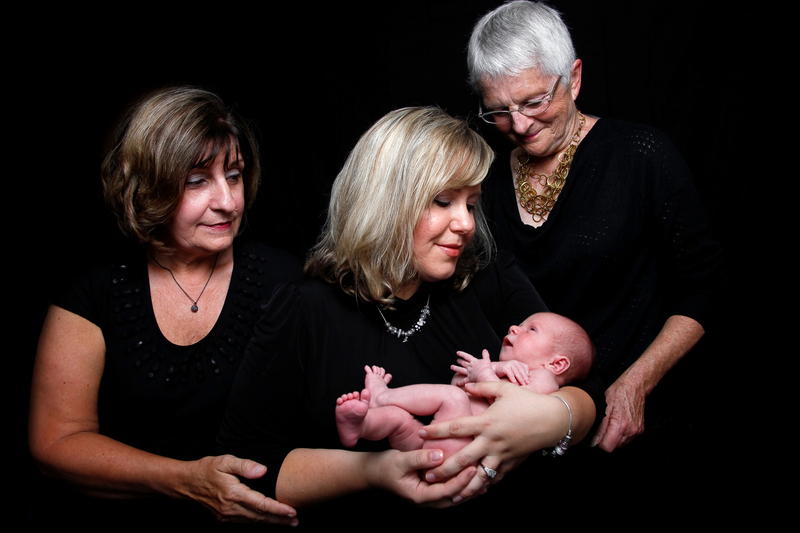 The photograph of all of the mothers holding Nathan I thought was especially touching. 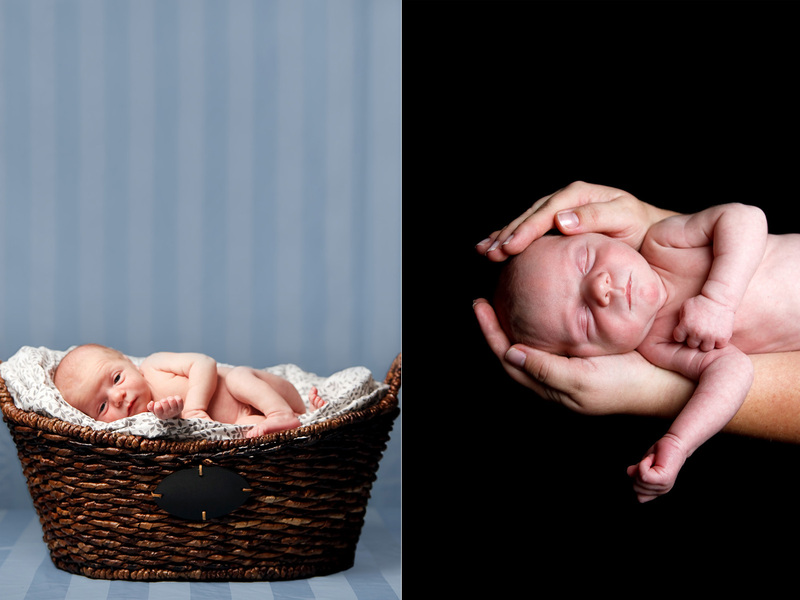 But I love the edge on the fussy portrait with daddy’s tattoo—it adds that extra something to classically traditional and minimalistic portraits. 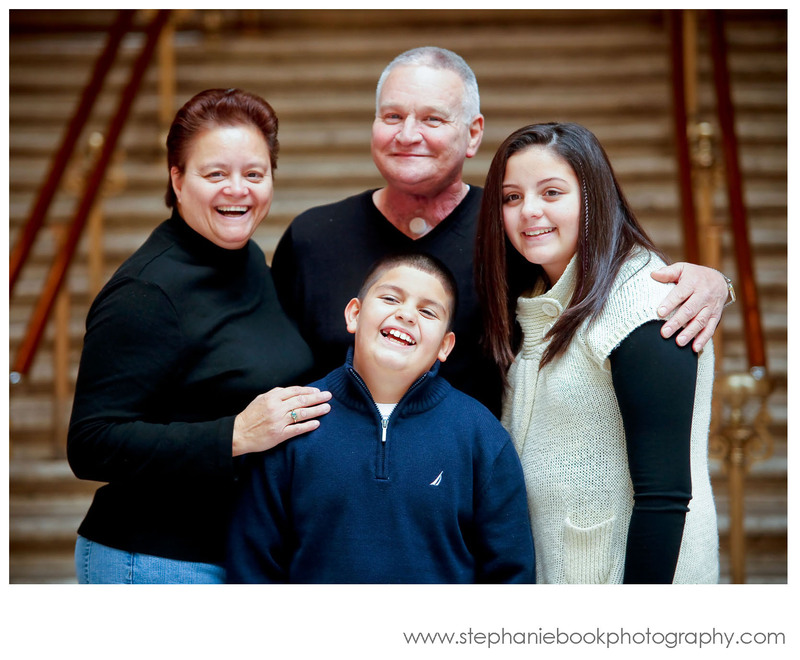 Nathan, it was a joyful challenge to photograph with you. 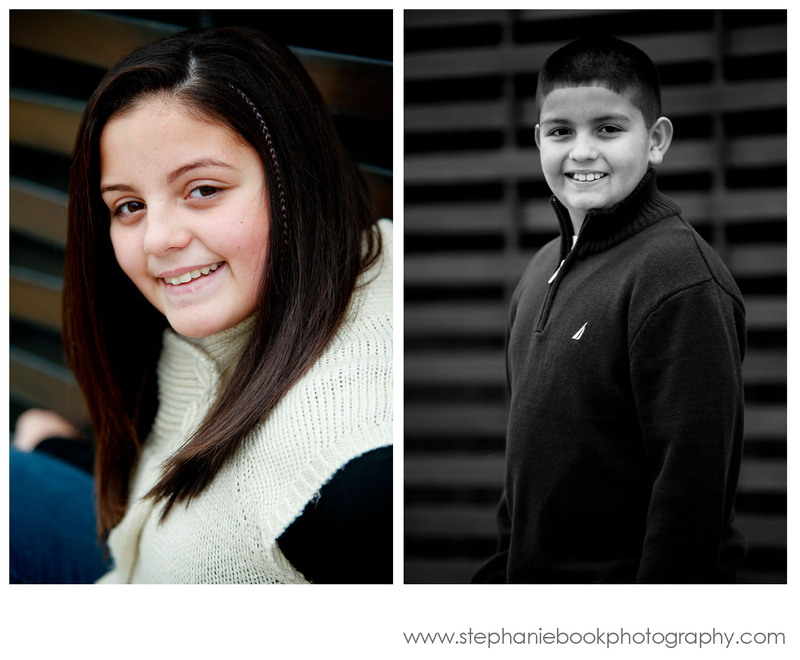 Allison and Michael, thank you for inviting me into your home and I hope your family enjoys your photographs. 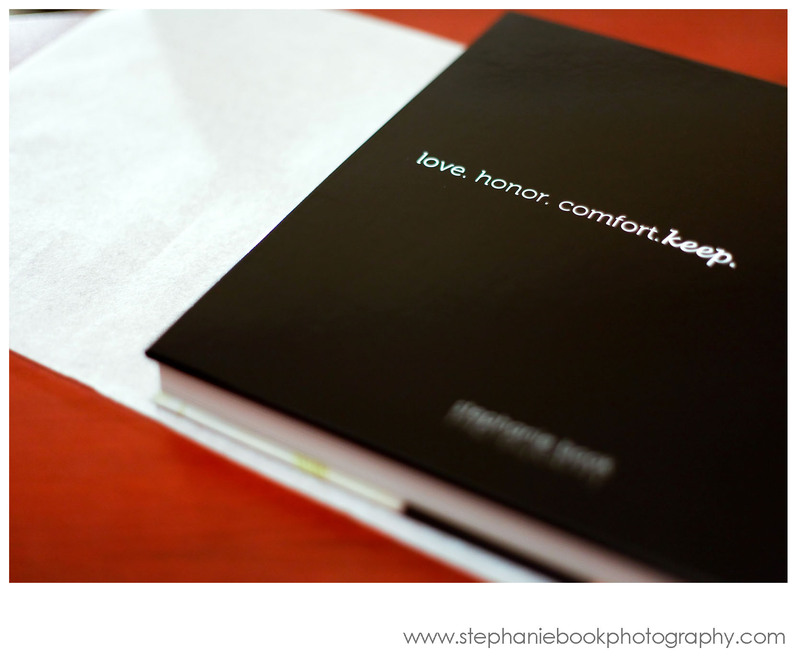 It’s the little touches that make each album really personal to each couple-like the phrase “love. honor. comfort. 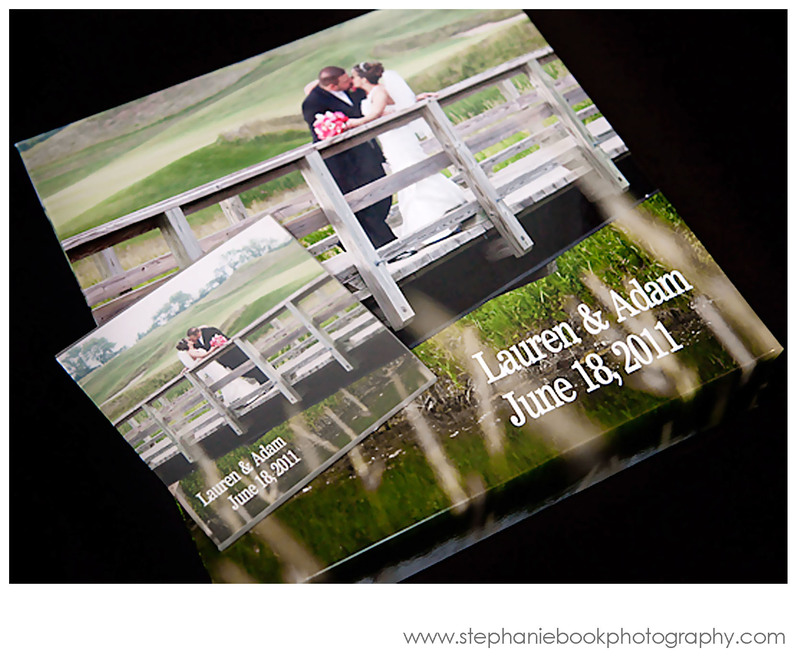 keep.” that was lifted from Lisa and Tim’s ceremony programs, font type and all, and used on the back cover of their wedding album. I love these tiny details! 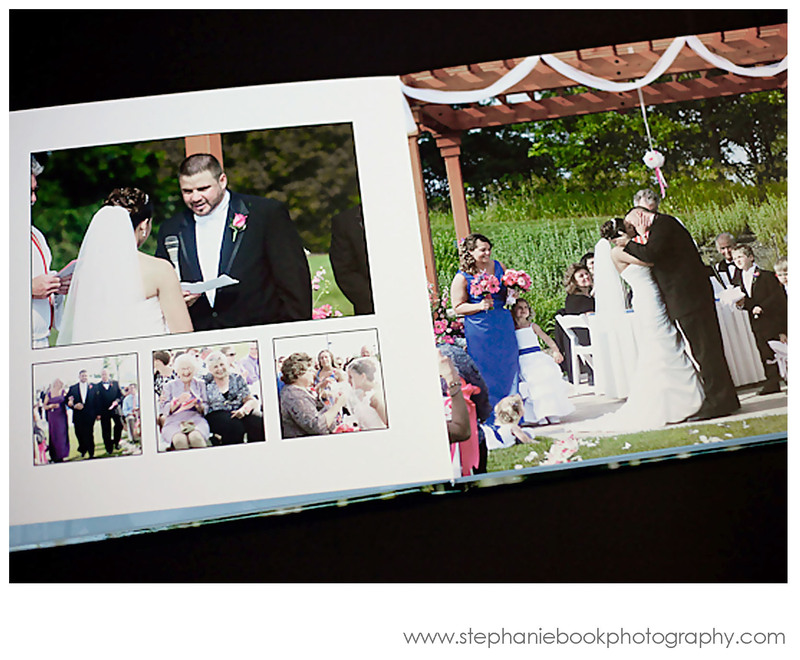 Click here to view Lisa and Tim’s full wedding album layout and the couple’s completed wedding slideshow. 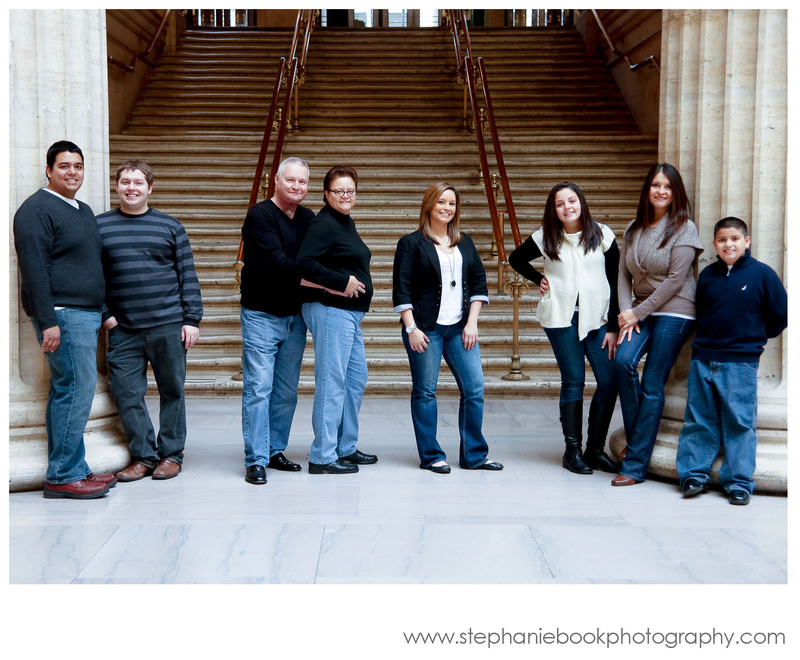 In November, I did a holiday photography session for Nicole and Robert, a fantastic couple that I met and worked with last year shortly after they moved to Chicago. 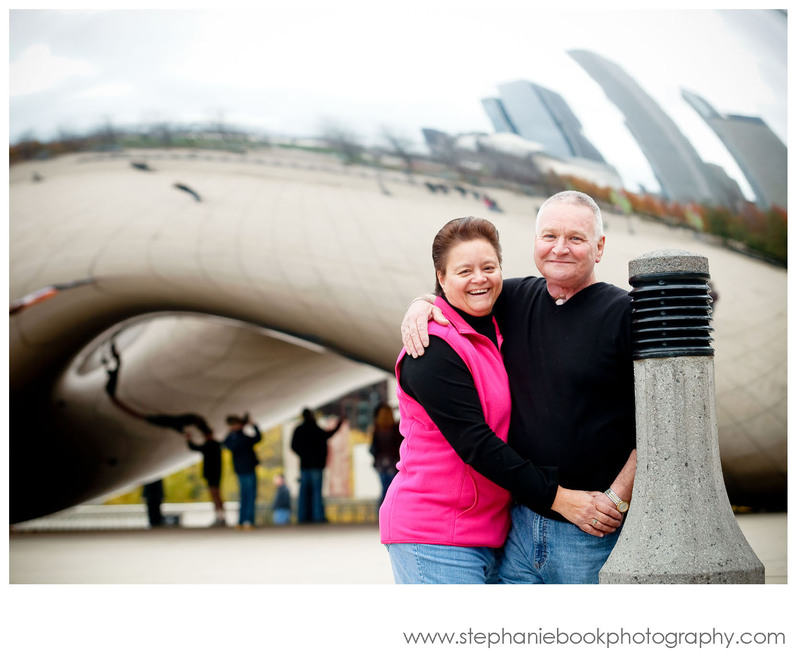 They wanted to celebrate their first year in this great city together with an iconic skyline shoot. However, this year when Nicole called she shared the wonderful news that she and Robert had started their family! 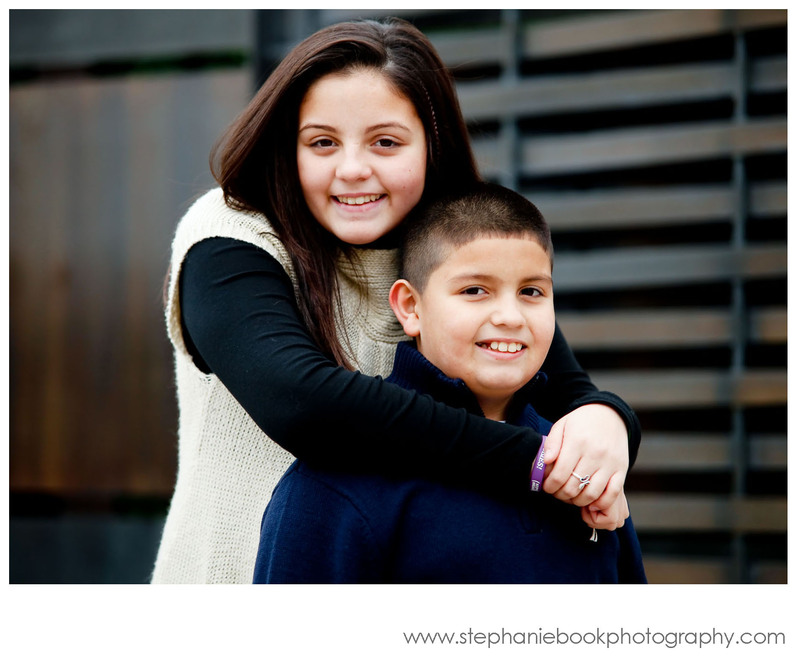 Little Elly would be joining our holiday session. And she was adorable-just look at her playing with those huge ruffles in her holiday skirt, and you’ve gotta love capturing a little baby yawn! 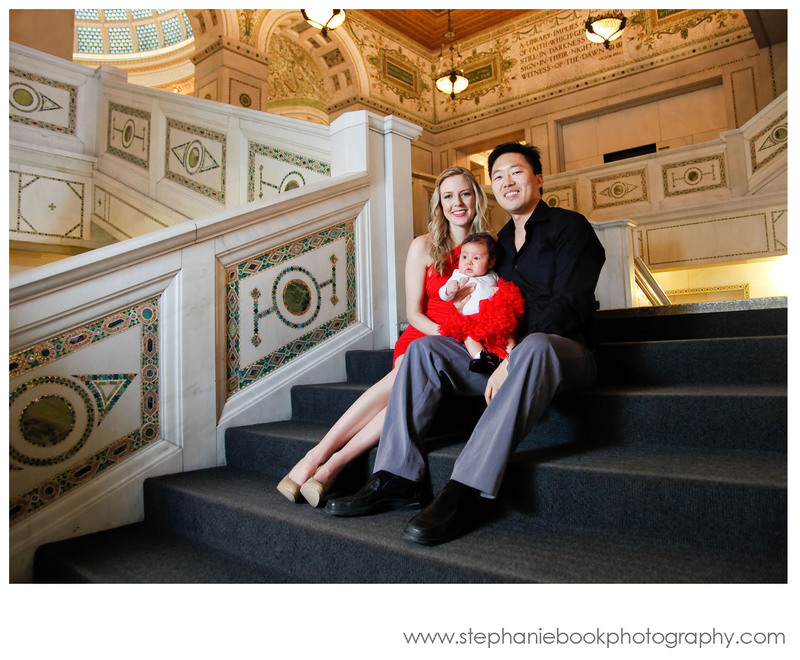 We began the session downtown at the Chicago Cultural Center, taking advantage of the fantastic architectural detail in their south staircase. Then we walked over to the south gardens at the Art Institute of Chicago. And finally, we ended at the Recreation Drive park district golf course building along the lakeshore. The day was a little windy-advisory level windy actually-but our outdoor locations provided enough protection from the elements. Elly was such a trooper; the wind didn’t even seem to phase her. Our shoot was wrapping up right around nap time, so Nicole and Rob were able to settle her into the stroller for just a couple minutes while we did a few portraits of just the two of them to end the day. 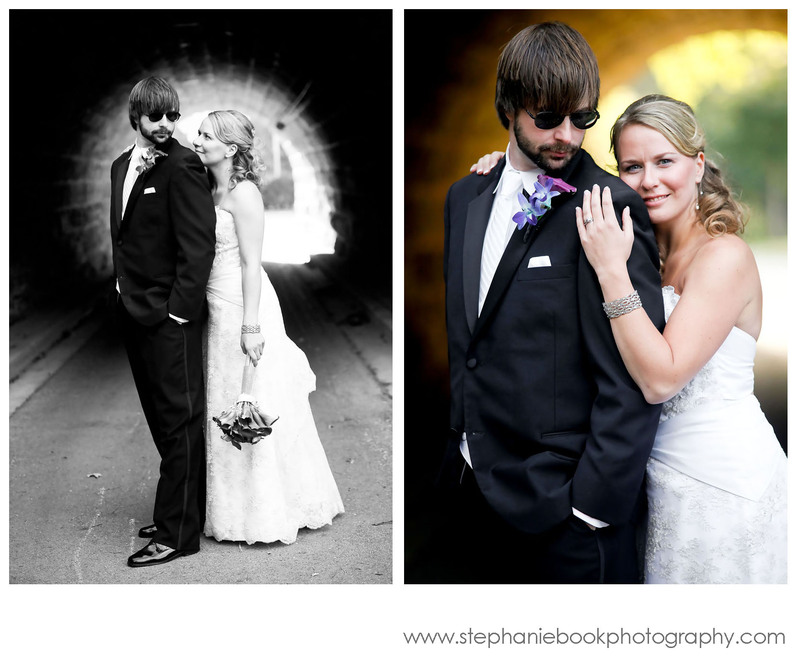 Nicole and Rob, thank you so much for the opportunity to shoot with you again. You guys glow as parents, and I can’t wait to see Elly grow year to year! 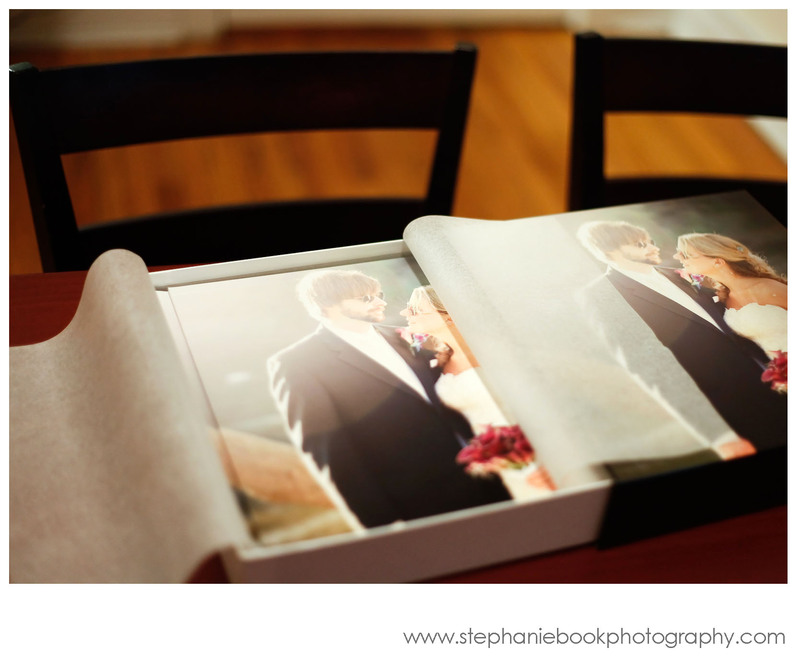 Between family portrait sessions this fall, I completed a couple wedding album layouts with one of my favorite album vendors. 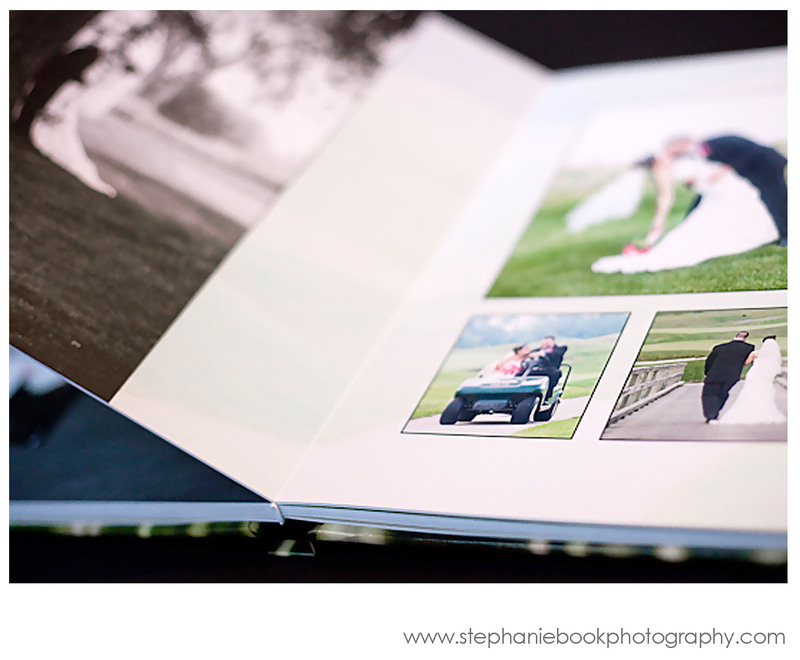 I’ve been working with Asuka Book to produce wedding albums since 2006. They consistently add new products to their portfolio that my clients will love and new services that will make my life easier. I’m a busy girl, so whenever you can same me time, you just made yourself a loyal friend. 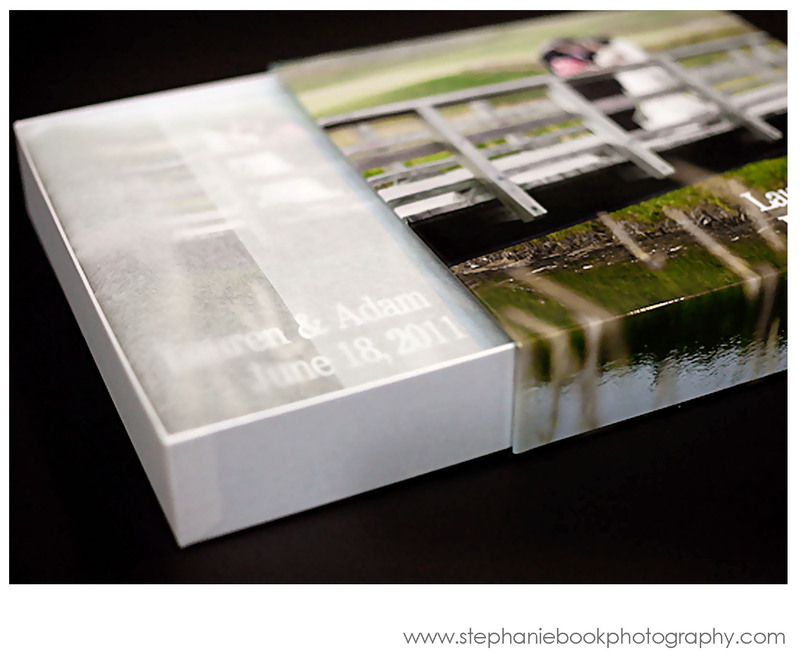 But moreover the craftmanship of their albums is just beautiful, I was so excited for Lauren and Adam to receive their storybook wedding album! 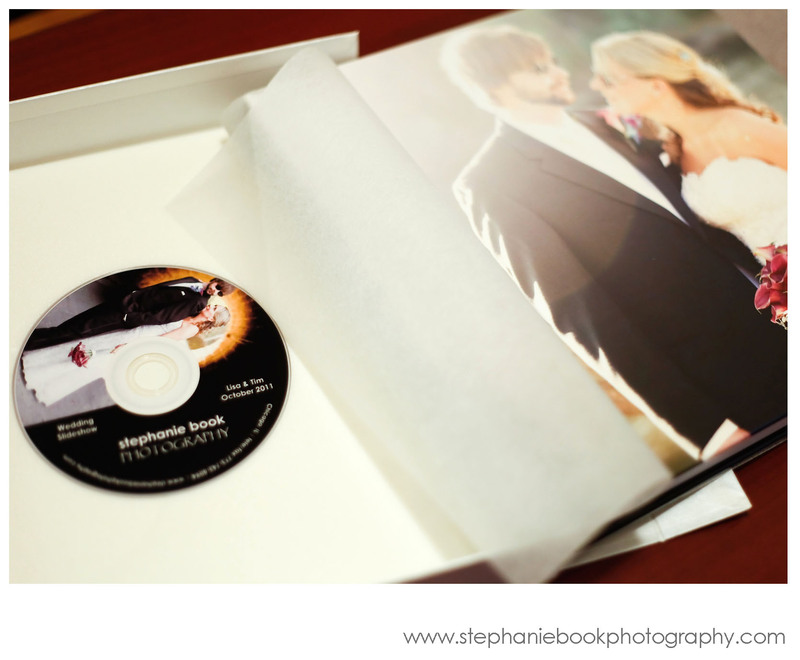 The presentation box even includes a DVD placeholder for their wedding slideshow. Perfect. 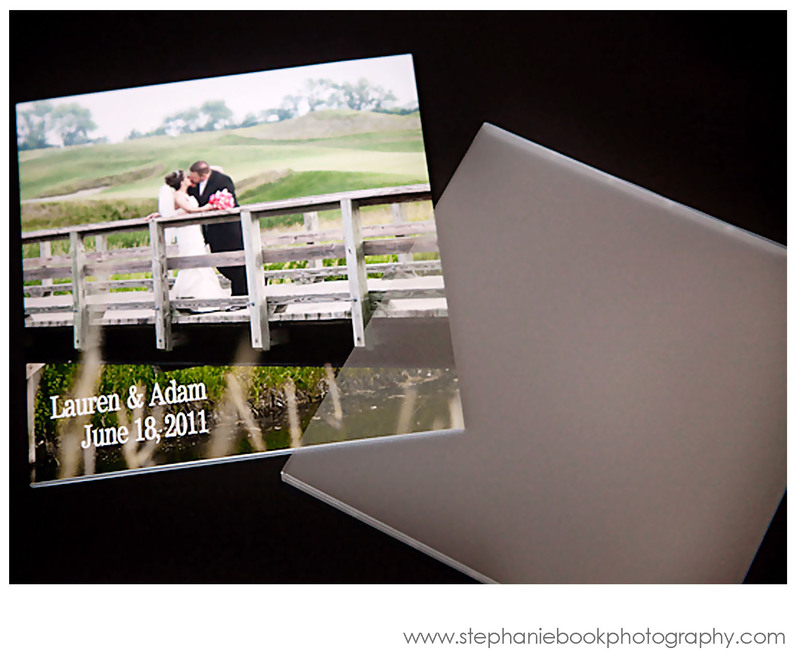 Click here to view Lauren and Adam’s full wedding album layout and the couple’s completed wedding slideshow. Well, I certainly let the busy holiday season get the better of me when it came to blogging. 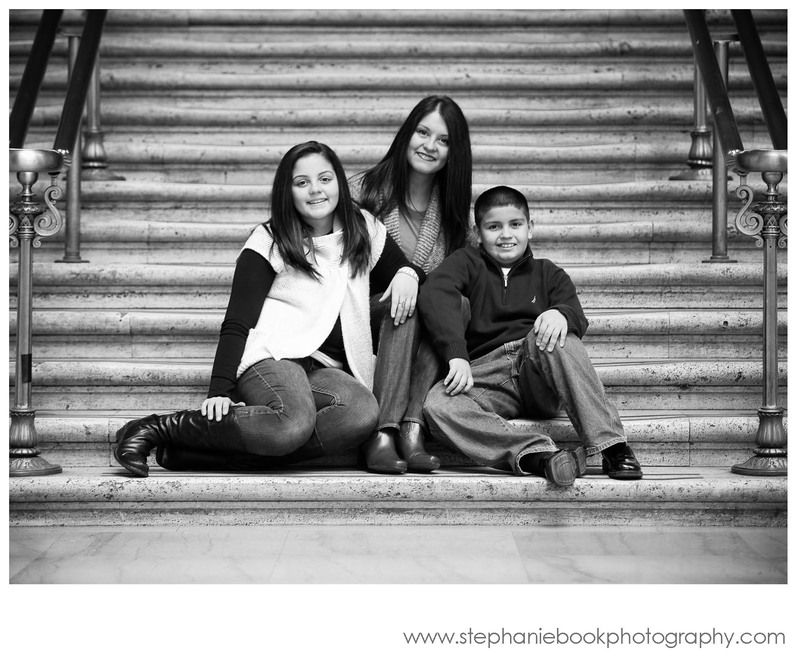 But after a wonderful holiday season with family and friends, I am getting back on the horse and with what a fitting family session post to begin. 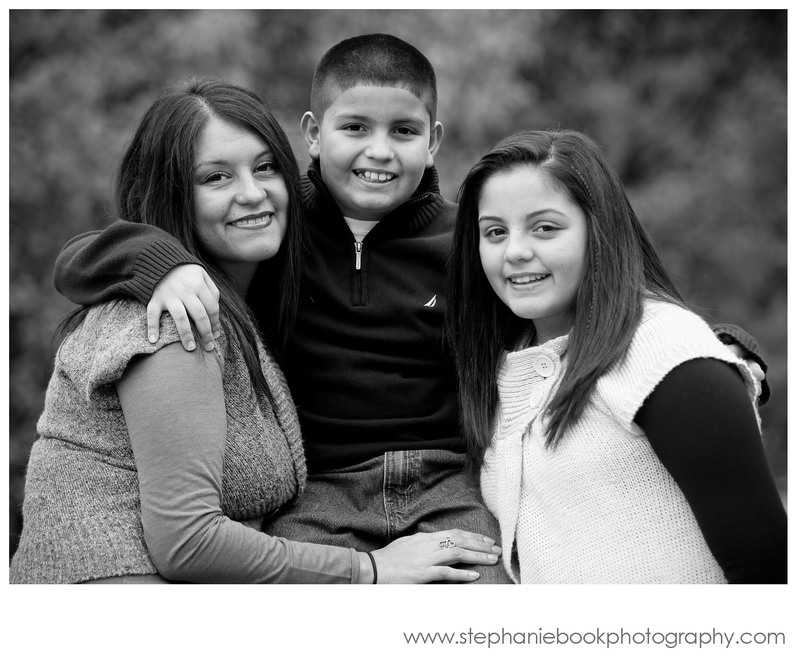 Sandy called me this fall to do a family portrait session for the holidays. I knew Sandy from grade-school and she and her children had just moved back to the Chicago-area from Tulsa. She was very excited to be near her family again, and so we included the whole clan-siblings and parents too. 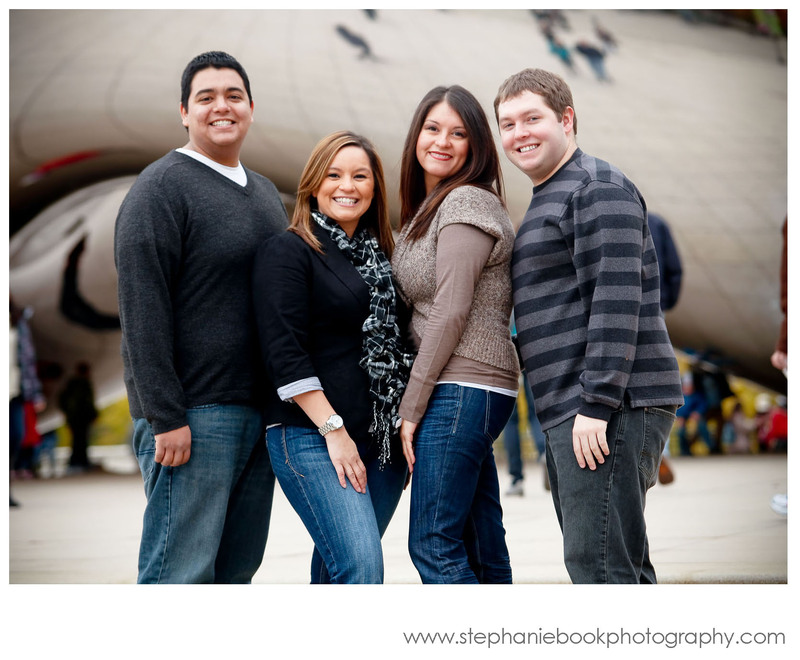 Wanting to celebrate Chicago in their first holiday portrait session back, we chose a couple landmark locations beginning the day in Millenium Park. Loved this!! 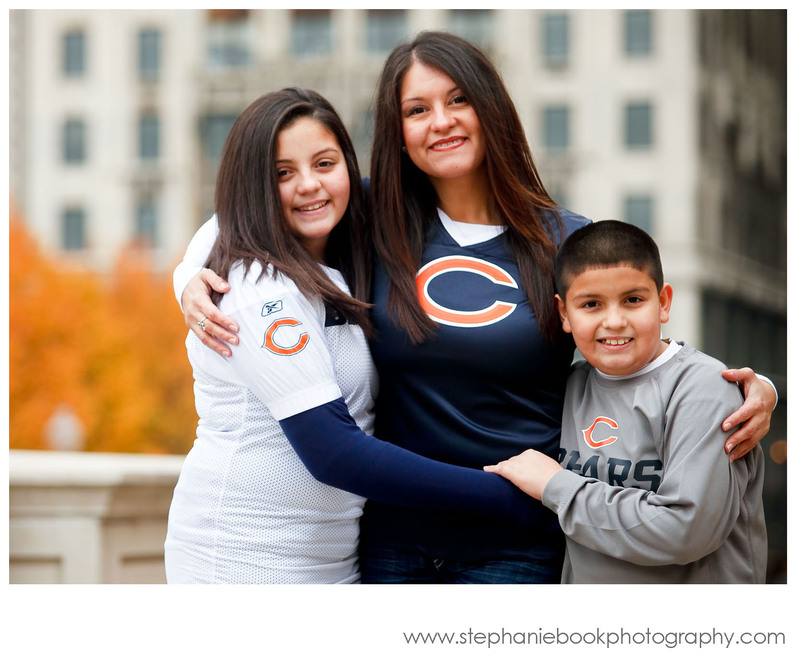 The family created a coat-walled human dressing room for Sandy and her kids right in the middle of the park for their Chicago Bears wardrobe change! 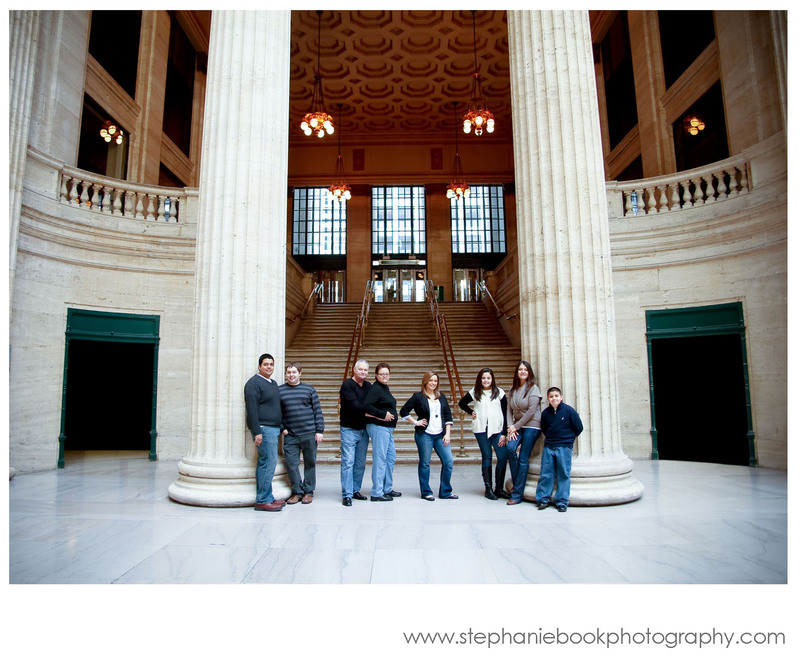 After we left the park we headed over to the iconic Union Station. I was surprised to see all of the old wooden benches removed from the lobby when we arrived. I can only imagine what a job that was for whoever had to do that! But of course we had alternate options with staircases and architecture of the building itself. 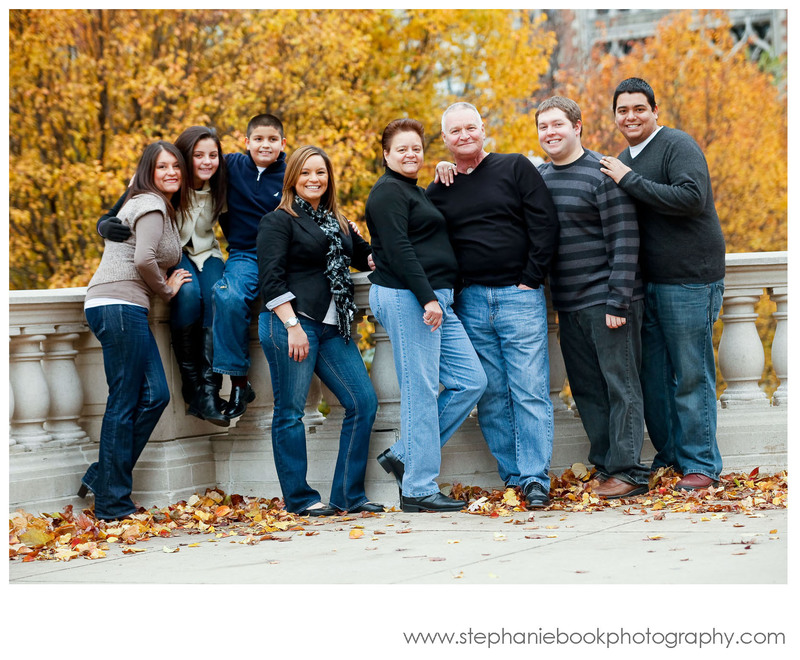 Her family had such a great sense of playfulness with each other. That kind of chemistry just makes the shoot. I really enjoyed catching up with Sandy again and getting to know her whole family. 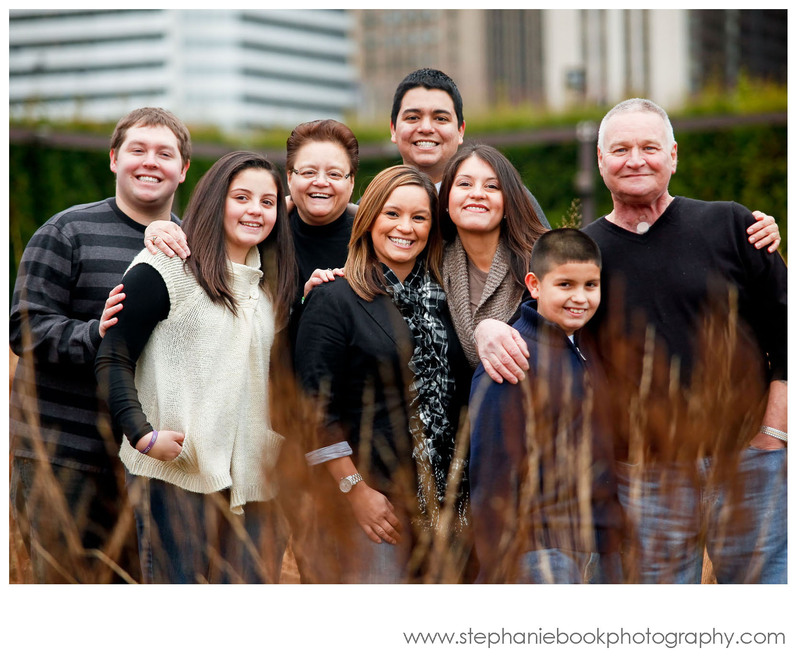 Sandy and fam, thanks for the opportunity, and I hope you all had a wonderful holiday celebrating togetherness. 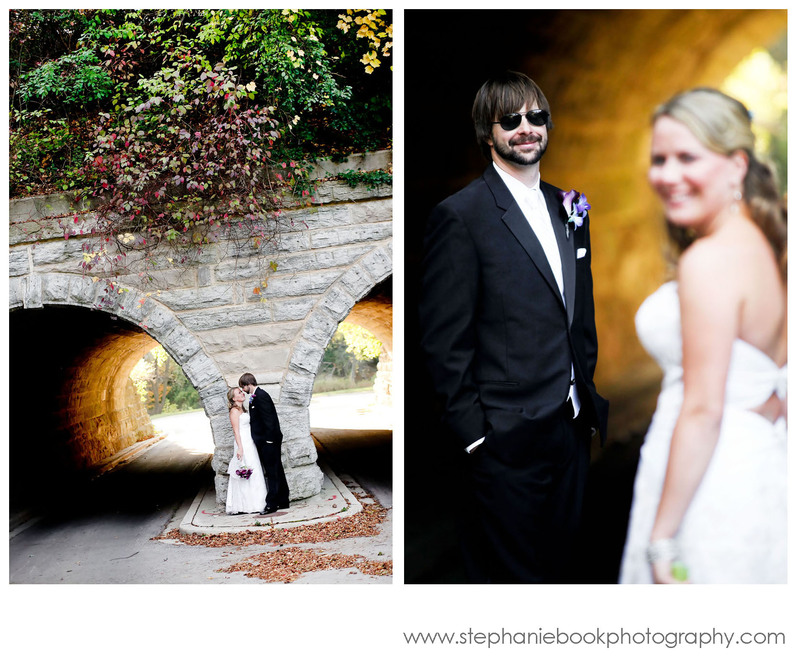 I’ve been so excited to post on the blog about Lisa and Tim’s October wedding in Milwaukee, WI. 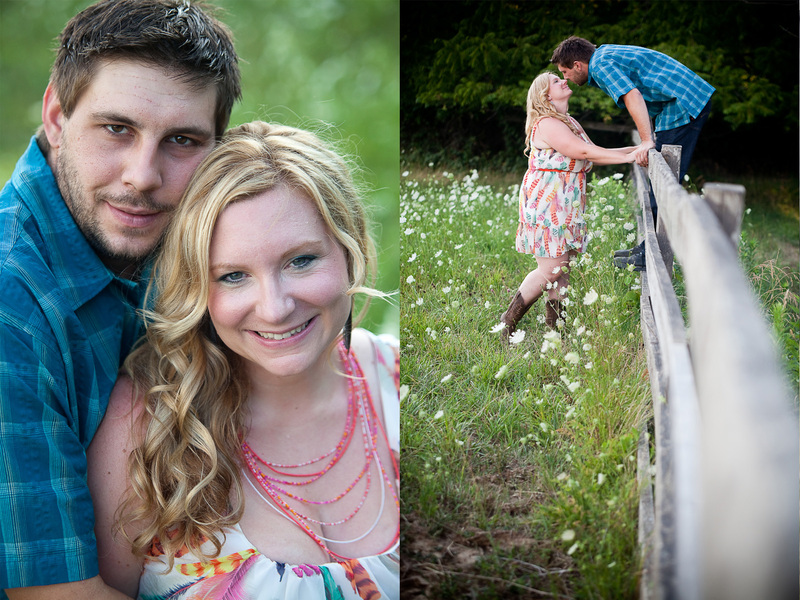 We had a fantastic time at their engagement session this spring. 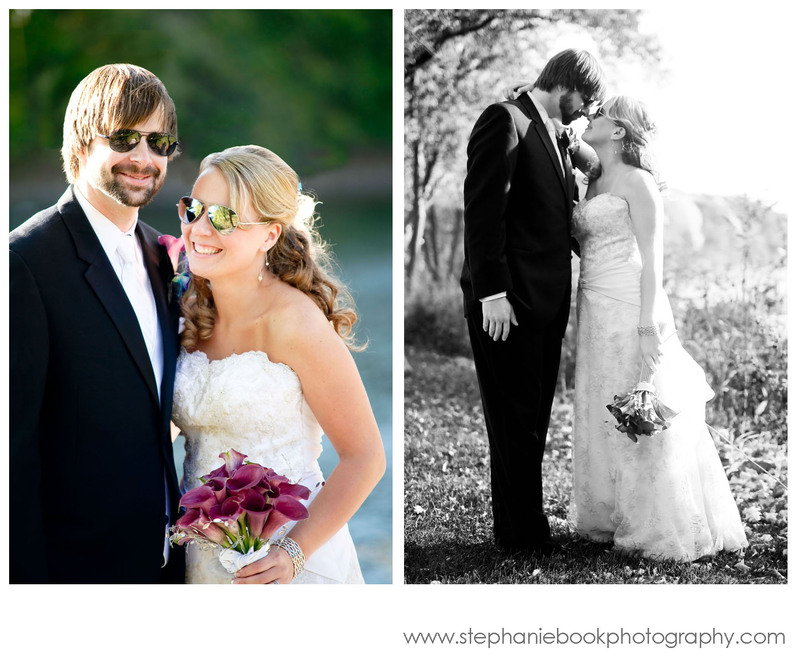 Lisa and Tim are active, outdoors people, very down to earth and we became fast friends. 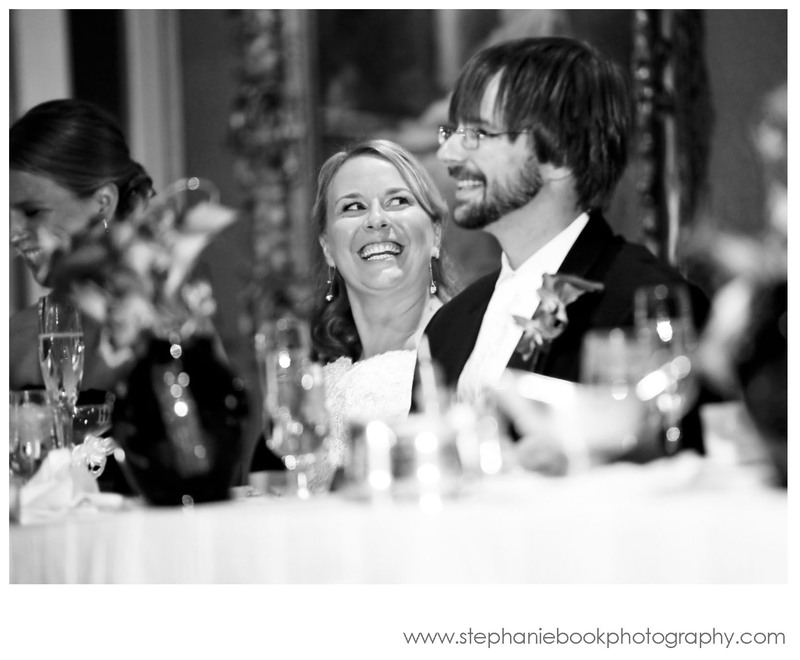 Their wedding day was no different. Just one night with their wedding party and guests it was obvious that they are surrounded with love in their lives, though they perfer to be the ones showering others rather than the ones at the center of attention. I left that night with many fun memories. I met Lisa and Tim through a referral, so I was already looking forward to seeing Jeanne Hudon who I photographed some years back as part of the band Solset. But it turns out that I share more friends than I knew with Lisa and Tim. As I was waiting for the ceremony to begin I was shocked to run into an old friend who apparently played softball with our couple. 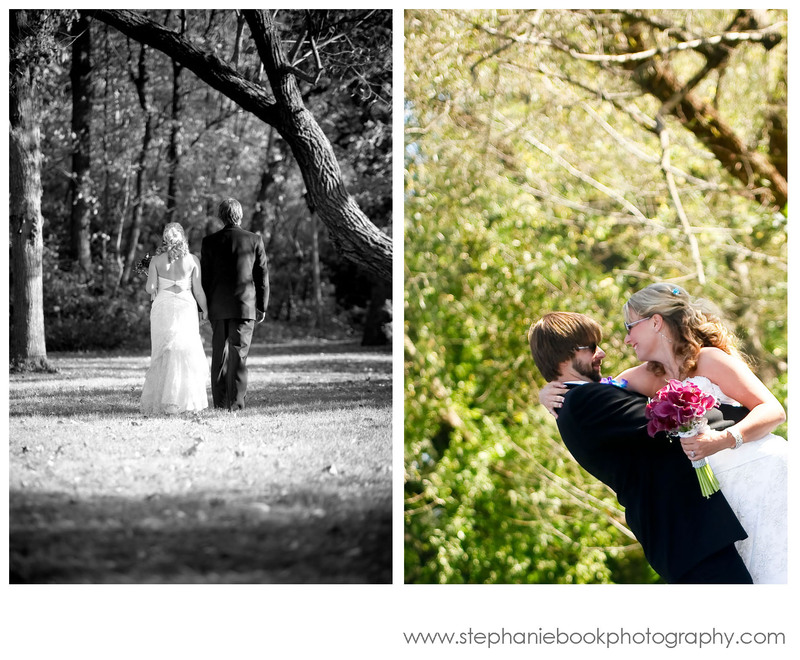 First time that’s ever happened to me while shooting a wedding–no wonder I like them so much! 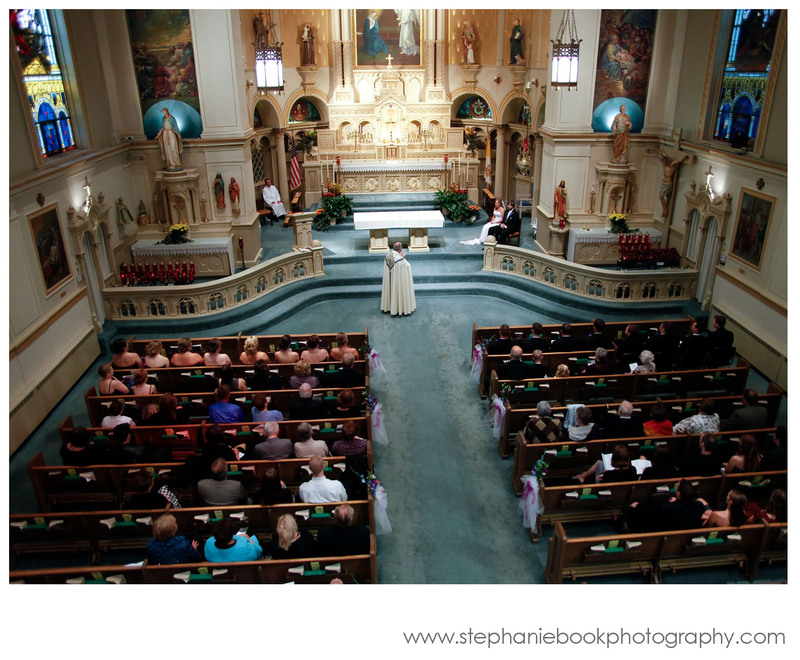 The ceremony took place at the Old Saint Mary Parish, just a few blocks away from the Pfister Hotel where the ladies got ready that morning and the reception was held later that evening. 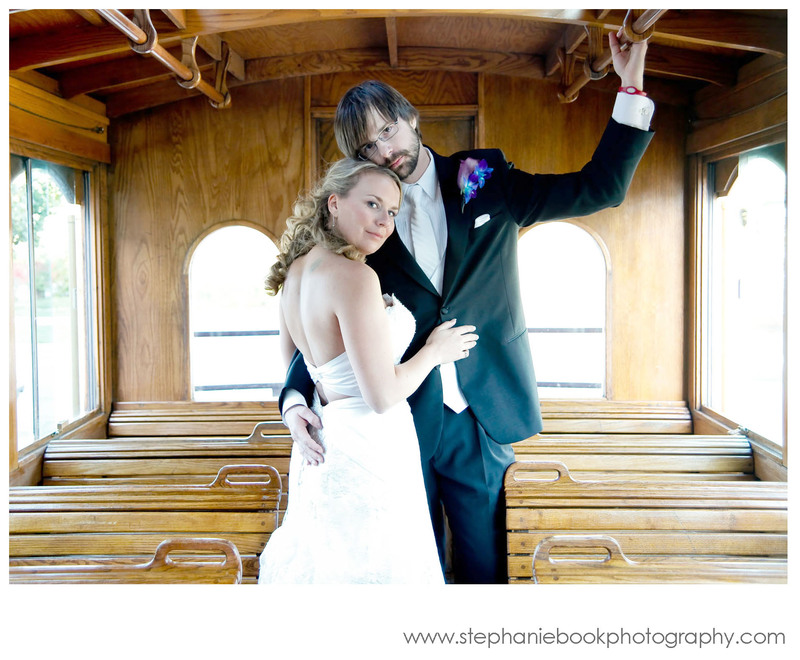 After the ceremony I boarded a trolly with the wedding party and headed out to Hubbard Park in Shorewood. There was a small crew of people already there setting up chairs for another wedding. 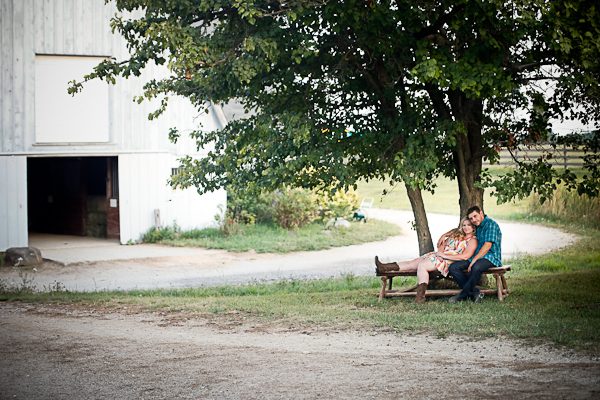 Luckily we had about an hour to shoot before their guests would start arriving. The park was a buzz with people taking advantage of a beautiful fall day. 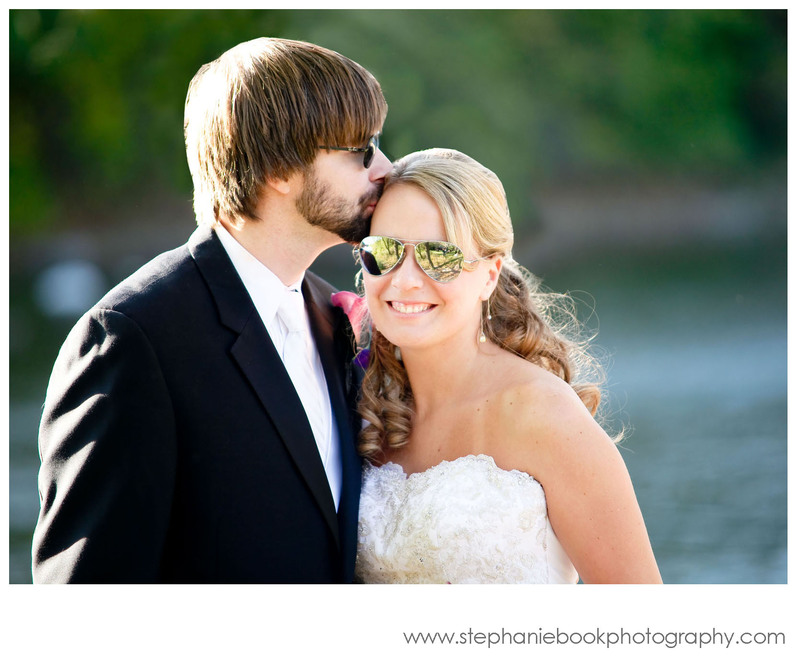 Tim forgot his glasses at the hotel and had to wear his perscription sunglasses throughout the shoot at the park. 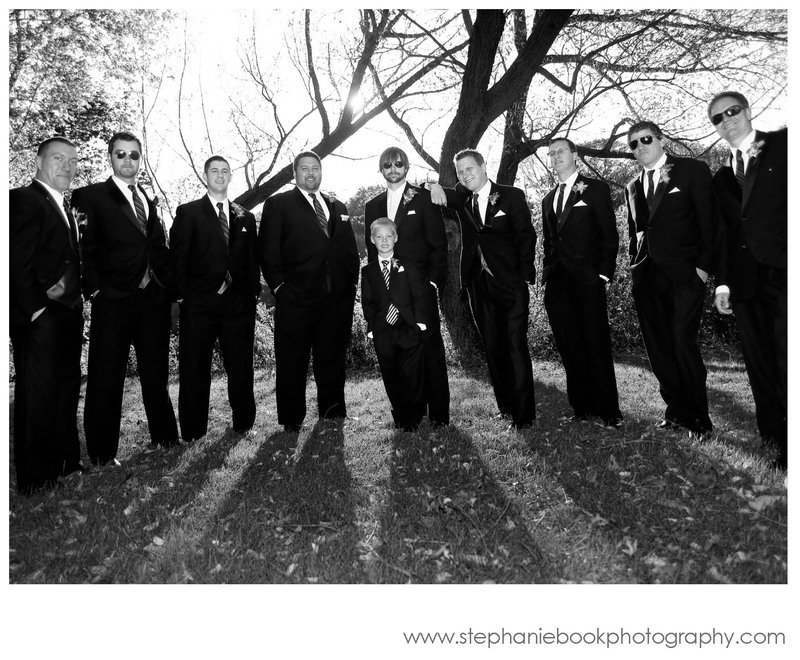 But no worries, because the bridal party came to his aid as though it were part of the uniform. I had never seen so many pairs of aviators on one trolley! 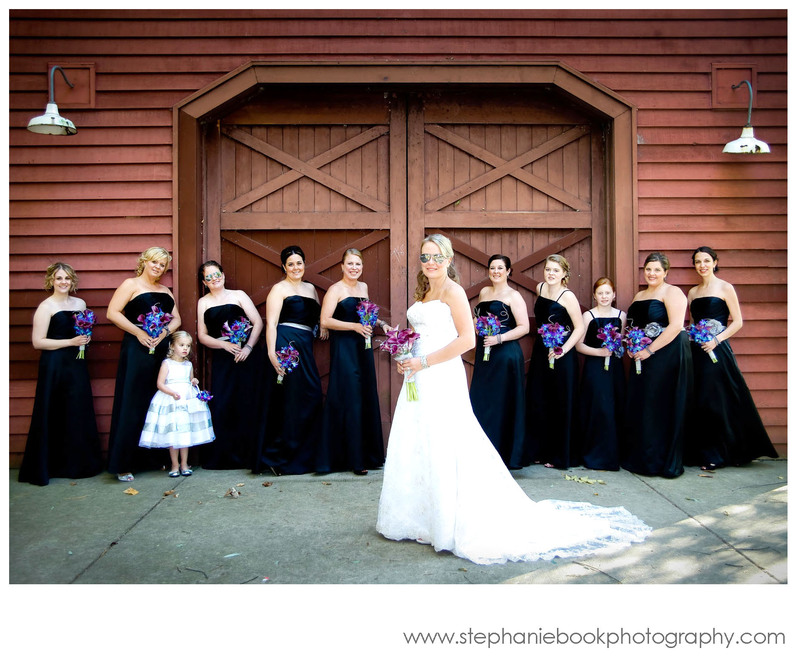 Can you guess what song the DJ played as they all marched into the reception hall that night? Hint-Top Gun. Lisa and Tim were suprised twice that evening with generous and unique gifts from the bridal party. Two arcade video game machines were a big hit, especially Police Trainer among the groomsmen. But overall the biggest surprise of the night and most popular guest was the appearance of Hot Dog, one of the Milwaukee Brewers famous racing sausages. The sausage also brought the couple a gift–a glass encased, signed baseball. 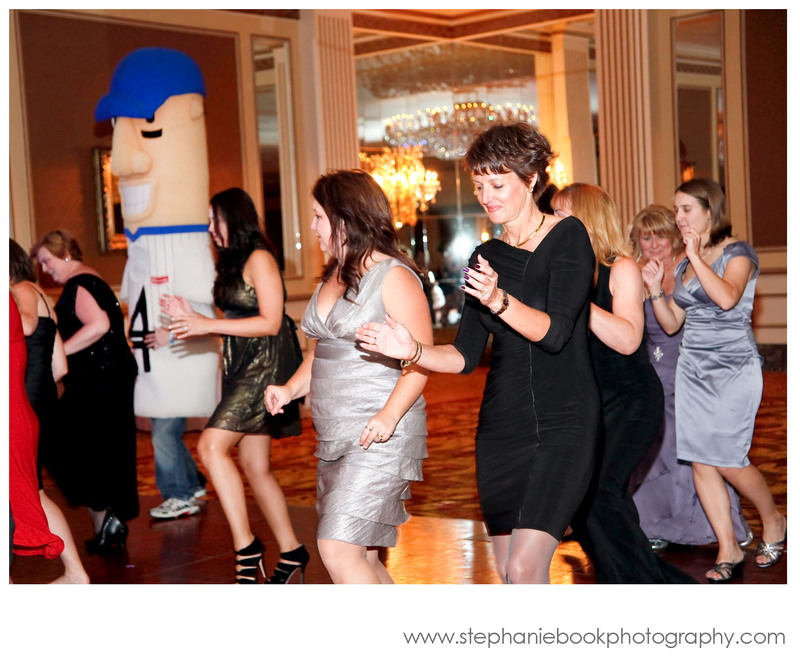 Of course Hot Dog raced the room, stuck around for photos with the guests, and even danced the electric slide before saying goonight and wishing the couple well. 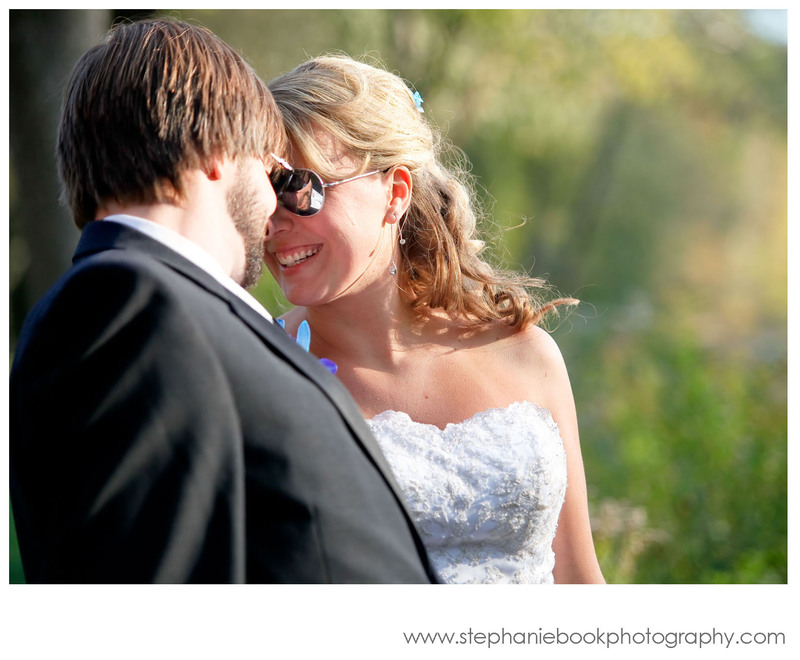 Lisa and Tim, I’m so grateful that I have gotten the chance to know you both and to share in this special day with you. 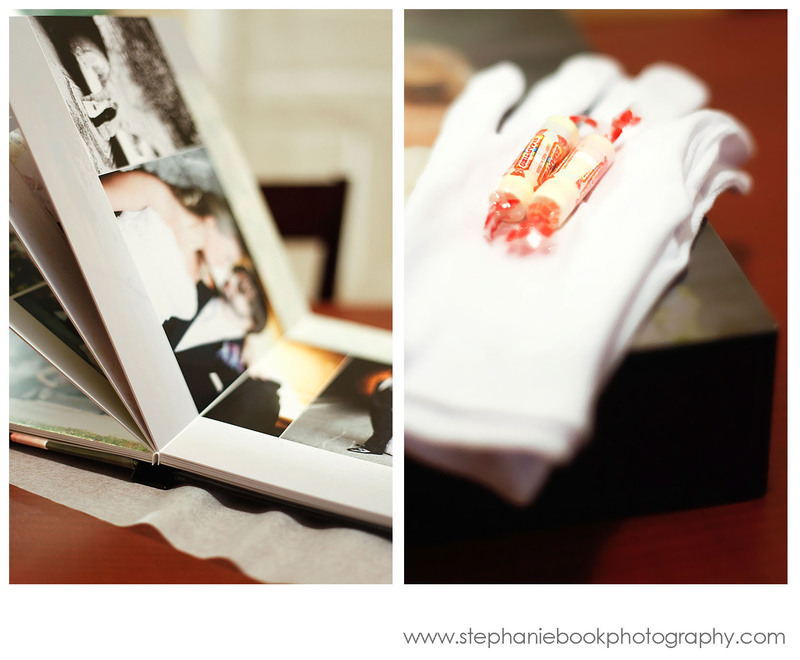 I can’t thank you enough for the opportunity, and I can’t wait to capture this story in your wedding album and slideshow. Many, many happy years to you!